FILE - Laborers transplant rice seedlings in a paddy field in Qalyub, in the El-Kalubia governorate, northeast of Cairo, Egypt, June 1, 2016. Rice grown while exposed to carbon dioxide levels expected by the end of this century had lower levels of vitamins, minerals and protein than normal, the results showed. The authors said the impact would be most significant for the poorest citizens of some of the least-developed countries, who eat the most rice and have the least diverse diets. In the study, published in the journal Science Advances, scientists grew 18 varieties of rice in fields in China and Japan. They pumped carbon dioxide over the plants to simulate the atmosphere of the future. Rice grown under high carbon dioxide conditions had, on average, from 13 to 30 percent lower levels of four B vitamins, 10 percent less protein, 8 percent less iron and 5 percent less zinc than conventionally grown rice. On the other hand, vitamin E levels increased by about 13 percent on average. FILE - A farmer works in a rice field in Naypyitaw, Myanmar, March 2, 2018. The results are bad news, "especially for the nutrition of the poorer population in less-developed countries, because this population depends for nutrition on rice," said study co-author Kazuhiko Kobayashi at the University of Tokyo. That includes roughly 600 million people in Indonesia, Cambodia, Myanmar, Bangladesh, Laos and several other nations, mainly in Southeast Asia, the report said. While research has shown higher temperatures from climate change and weather extremes will cut food production, especially in the tropics, scientists are increasingly finding that rising greenhouse gas levels are a threat to food quality as well. Earlier studies by Harvard University researcher Sam Myers and colleagues showed that wheat, maize, rice, field peas and soybeans grown under high carbon dioxide conditions all had lower levels of protein and minerals. The scientists estimated that roughly 150 million people might be at risk of protein or zinc deficiency by 2050. It's one example of the surprises climate change has in store, Myers said. 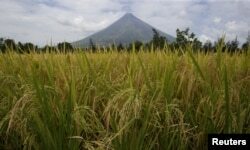 FILE - Rice stalks ready for harvesting are pictured in a field near the Mayon volcano in Daraga, Albay, in central Philippines, April 3, 2016. "If you and I sat down 15 years ago and thought about, 'I wonder how dumping enormous amounts of carbon dioxide into the atmosphere will affect our well-being,' I think one of last things we would have come up with is, 'I bet it will make our food less nutritious,' " he said. "My concern is, there are many more surprises to come," Myers added. He noted that global pollution, biodiversity loss, deforestation and land use change, and other human activities are likely to produce unexpected problems as well. "You can't fundamentally disrupt all the natural systems that we have adapted to over millions of years of evolution without having these ripple effects that come back to affect our own health and well-being," he said. The new study suggests a way to minimize the nutritional impact of climate change. "Different [rice] varieties showed quite different changes in response to higher carbon dioxide concentrations," Kobayashi said. Rice breeders can use these differences to create varieties that are less affected by greenhouse gas levels, he said.